Welcome to Tea Party Tuesday! We're delighted today to have a special guest, author Leslie Matthews Stansfield, known as Lee by her friends. It's such a delight to have you join us today. Let me pour us some tea and we'll get started. Milk? Sugars? Please help yourself. Thank you, Nancy Jill. It's a pleasure to be here. Please have a sandwich. We have several kinds to try. Thank you. They look delicious. Please tell us about your new book, which I understand is part of a series. My new book, Mr. Tea and the Bobbin’ Body, is the second in the Madeline’s Teahouse series. The series involves two sisters, Karen and Terry Sutter, who turned their childhood home into a teahouse after the death of their mother Madeline. They have a possibly psychic macaw named Mr. Tea who is prone to make outrageous comments. In this book, the sisters are involved in a high school reunion that suddenly turns deadly when one of the guests, a former football player, is found bludgeoned to death in the swimming pool. Terry's boyfriend, Detective Greg Mullins, and his partner, Tom O'Hara, are on the case. When another body turns up, Terry and Karen, along with two loveable seniors, Uncle Henry and Aunt Rose, who live next door, put their heads together to try and find the common thread. What they uncover is a terrifying story of brutality, revenge, deceit and old secrets that won't stay buried. Oh, my! I'm sure readers will find it fascinating. Please have a pastry. I have to confess I bought these at a bakery. Lee, it has been a pleasure to have you as our guest today. We look forward to reading your books! And best success with your Madeline's Teahouse series. We'll see you next week! For more information on Lee, please read her bio and follow the links to purchase her books. LESLIE MATTHEWS STANSFIELD is the author of Mr. Tea and the Traveling Teacup, the first book in the Madeline's Teahouse series, and Mr. Tea and the Bobbin’ Body. She is also the author of a previous book, Windsor Locks, on the town she lives in. She grew up in Delmar, New York, and credits her friends with developing her imagination. Leslie is a graduate of University of Hartford and received her Masters' degree from the University of Phoenix in Educational Leadership. She is a math tutor in a public school. 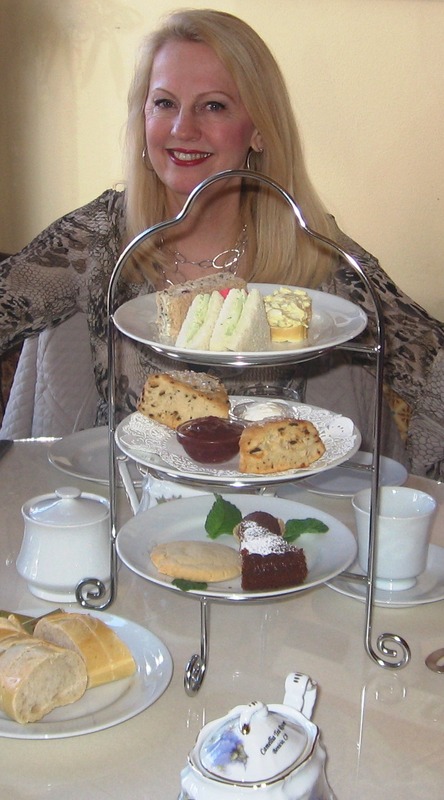 She is currently working on her third book in the Madeline's Teahouse series. She has four children and eight grandchildren and lives in Windsor Locks, Connecticut. Tea Party Tuesday ~ Making a Change? Just ask.